The Chinese electric two-wheeler market is predicted to grow at 6.7% CAGR during the forecast period with its fleet size reaching 52.9 million units by 2024. 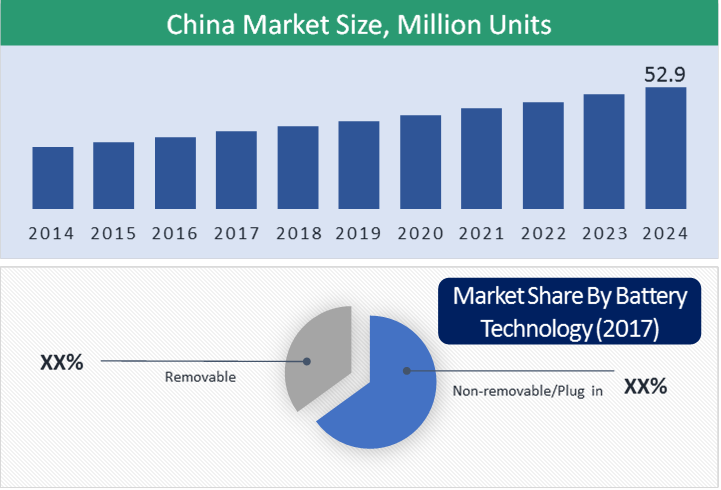 The Chinese market is primarily driven by the increasing demand for electric scooters in the country, favorable government regulations, the presence of a large number of local players and increasing investment on battery technology development. Different products including e-scooters and e-bikes are majorly contributing to the electric two-wheeler market size in China. 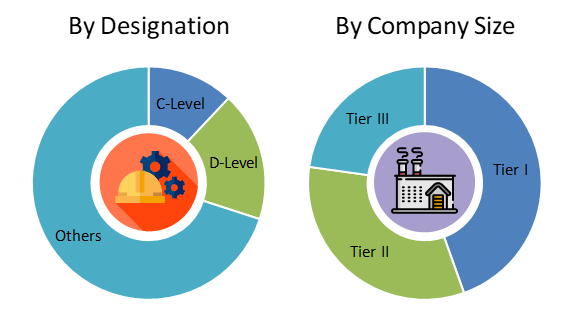 The market has witnessed significant demand for these products over the last few years with the increasing urbanization and increasing disposable income. Based on the product, the market is categorized into e-scooters, e-bikes, e-motorcycles and others. E-scooters hold the largest share in the Chinese market, in terms of revenue as well as fleet size. E-scooters as indicates itself are electrically powered motorized vehicles, with a floorboard design that distinguish it from e-motorbikes. Top speed of e-scooters is more than 25 km/hr and generally around 50km/hr. The prices of e-scooters have fallen to a great extent for the same performance variables over the years and their low maintenance cost makes them preferred the mode of daily commute for consumers in China. On the basis of battery type, the market is segmented into sealed lead acid, Li-ion, and NiMH. Of all, sealed lead acid is the most common type of battery used in the electric two-wheelers in China. Comparatively lower price of sealed lead acid battery and their high-power output makes them preferable battery for electric two-wheelers segment. Based on voltage, the market is segmented into 24V, 36V, 48V, 60V, 72V. Of all, 48V electric two-wheeler hold the largest share in the Chinese electric two-wheeler market, followed by 36V two-wheelers. Most of the e scooters run with a battery of 48V which provides it optimum power to perform better in the congested metropolitan cities of the country. The increasing demand for electric scooters in the country, favorable government regulations, presence of large number of local players and increasing investment on battery technology development are the key factors fueling the growth of the electric-two wheelers market in China. The Chinese Government is actively adopting policies for the replacement of its conventional fuel operated vehicles fleet. Two-wheelers are comparatively easier to develop and manufacture at a low cost; thus, leading to the growth of the Chinese electric-two-wheelers market. Uncertain legislation for the regulation of electric two-wheelers s have led to uncertainty in the market. With the lack of regulations, government in several cities of China is planning to ban or allow the usage of only licensed electric vehicles. This results in the uncertainty in the market and thus hampers the manufacturing and adoption of these vehicles in the country. Market players in the Chinese electric two-wheeler industry are investing capital to develop low-cost electric two-wheelers with better performance to provide them a distinctive advantage. In October 2017, Yadea Group Holdings launched Z3S, its new model of electric two-wheeled vehicle, at the China National Convention Center in Beijing. The new model has 37 enhancements made to its older version Z3 and incorporates several automotive-grade smart technologies such as automotive remote sensing, GPS, real-time monitoring and tracking of the vehicle's position and travel route. 6.2. AIMA Technology Group Co. Ltd.
Table 21 Snapshot – AIMA Technology Group Co. Ltd.
AIMA Technology Group Co. Ltd.